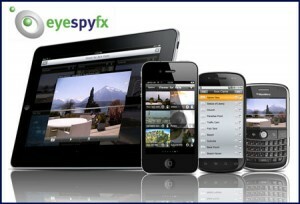 EyeSpyFX is pleased to announce that our iOS app “Viewer for AXIS Cams” has been updated. The new app has many performance upgrades and now features an In App Purchase enabling access to Edge Storage. 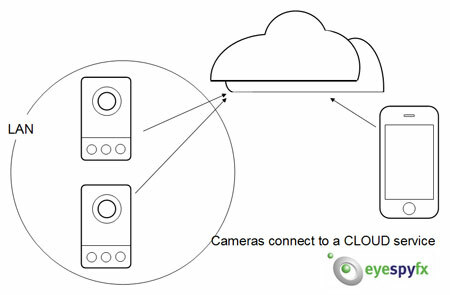 Edge Storage is a development in AXIS network cameras that enables video recording directly to an on-board SD-Card or a Network Attached Storage (NAS) device. It is sometimes referred to as local storage or onboard recording. 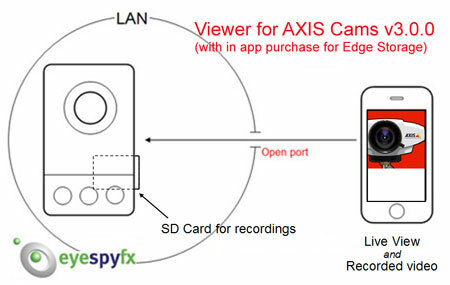 With mobile access to Edge Storage “Viewer for AXIS Cams” users can create a complete security system with motion detection event recording all onboard a single camera. This could give a perfect solution for a small business owner who is keen to monitor live and recorded events while away from the premises. We are pleased to announce that our HVR for the Secure-I cloud based hosted video security cam service has been updated. The HVR mobile app now offers full support for AXIS Video Encoders. This development extends on the compatibility with AXIS Network Cams and now enables you to use older analogue based cameras via an AXIS Video Encoder box and still enjoy the Mobile viewing benefits of Cloud based security monitoring and recording. 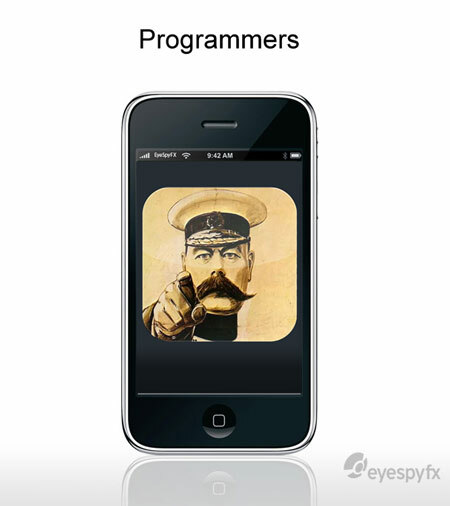 EyeSpyFX are a small team of specialist app developers making enterprise strength security cam apps. We are based in Derry/Londonderry in Northern Ireland. We are working exciting new projects at the leading edge of the IoT, M2M app technology and services. We are looking for super clever computer science graduates and/or programmers with 1 or 2 years development experience. We move quickly, you are flexible enough to weigh in wherever the need is. You have meticulous attention to detail and expertise in Java, C Sharp and/or Objective C. Knowledge and experience of LAMP server side technologies would be an added advantage. Cameras connect to a user account service hosted in the cloud. 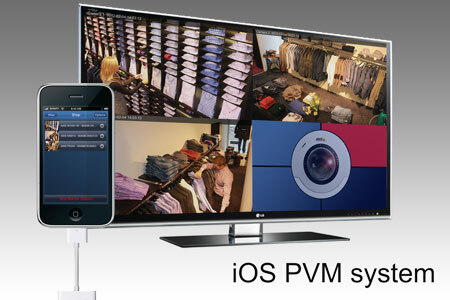 Mobile viewer apps connect to the same user account to view live cameras and recordings. This type of service is known by many names, for example: VSaaS, (Video surveillance as a Service) AVHS (AXIS Video Hosting Service), HVR (Hosted Video Recording), VSP (Video Surveillance Provider), MVS (Managed Video Service). 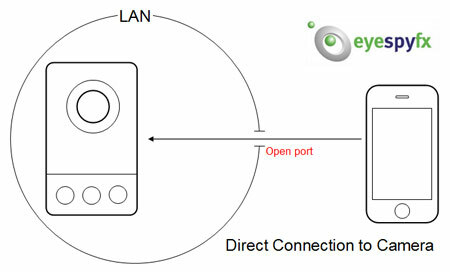 A major advantage of a VHS system is that there is no need to open a port on your LAN. This makes it idea for locations where the It manager will never agree to open a Port – Doctors surgeries for example. It is also idea for businesses with multiple locations, for example franchise businesses. Storage of the recorded Video is offsite and this feature also provides some key advantages. 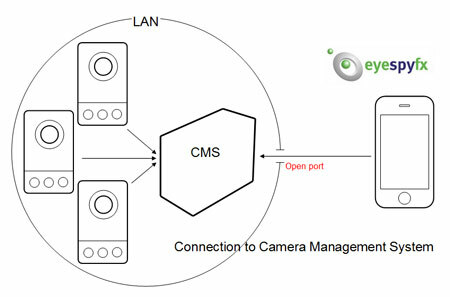 Cameras within a LAN connect to a CMS (for example AXIS Camera Station). Custom built Mobile Apps are required to connect to specific CMS software. Mobile apps can connect to a CMS system via an open Port. These systems can be very large and suit installations up and above 100 cameras.